"I loved Modern Sorcery by Gary Jonas! I couldn't put it down once I started. I read all night long and then I borrowed my friend's kindle to finish it the next day since I didn't want to lug my lap top with me everywhere I needed to go. But I would have if necessary. I didn't want to stop reading, I had to find out what happened next!" Way too cool! Thanks Debbie! "I started reading it yesterday at about 4 pm and finished it at 9 pm. This also included a break for dinner and bathroom breaks because I was about to explode. (I know way too much information) But I couldn't stop reading. I had to find out what happened with Jonathan and Kelly, who, by the way, is now my ultimate feminist hero." What cool reviews! What are you waiting for? 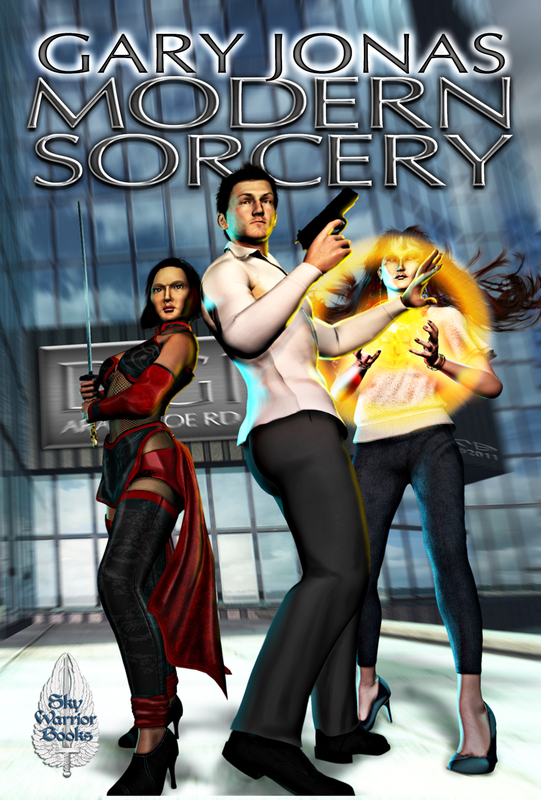 Purchase Modern Sorcery for a mere $3.99. In my last Fencon report, I failed to mention the odd stuff, which included my sister's cat, Howard, who is affectionately known as Howard the Shelter Cat, and like Sid the Llama, seems to have his own fan club. Thursday night before Fencon, I was staying at my sister's house. I brushed my teeth and went to bed, leaving the bathroom door open. In the morning, I found my paper cup was tossed on the floor, the mats were skidded against the bathtub, the toilet paper was now in a nice little pile by the toilet, and my toothbrush was gone. Now, I suspected that Howard had stole the toothbrush, probably concerned about dental hygiene (and who wouldn't be?). But I was concerned that he might have given it to my sister's dogs to chew. Thankfully, my sister had provided an unopened toothbrush in the bathroom for just such emergencies as "A cat ran off with my toothbrush..." so I could continue to brush my teeth. My sister later found the toothbrush stashed in Howard's closet. I told my sister that he could keep it. On the way home, I had to go through security, and sure enough, TSA was kind enough to pick me out for that machine that hits you with a bunch of radiation and undresses you. I told them I would opt out, because of the radiation. Well, well, well. First they tried to tell me that the machine didn't use radiation (WTF? ), but I was well aware of the terminology and said that I was "opting out." The screener was professional and even changed her gloves before frisking me -- she asked if I wanted it private, I said no. At the end, the woman tried to explain that the machine didn't show pictures of people naked. I told her that wasn't my objection. I said I was familiar with the concentration of radiation that machine used. She asked me what radiation was. No, I'm not kidding. She had no clue what radiation was. My explanation was dumbed-down, to say the least. She looked concerned when I told her that it could cause cancer. Yep, these are the people who are handling airport security. Thought you'd want to know. Zombiefied and Healing Waves are now available! I managed somehow to get to Fencon last week, despite my crazy life and tons of work. Despite having to take two very full planes each way, I ended up sleeping through the flights. Lately, I've been dealing with stress through sleep, so sleeping on planes was pretty easy. Fencon is in Dallas/Ft. Worth, which usually means ridiculously hot weather in September. This year, it wasn't too bad -- it was actually cooler than Montana, which is odd, but we've had a really late summer and very odd weather. I stayed with my sister and drove back and forth to the con hotel. I think going to cons means meeting up with a gazillion people you haven't seen. That meant a fair number of YDP (yard dog press) folks, which proved awesome. I think I sold some books (good) and promoted the publishing house (great). My sister took some time to show me InDesign, so I don't feel so out of place with it. If I missed you at Fencon, please forgive me. I was stretched pretty thin with all the convention stuff. Lots of good panels and good people. It was great seeing Selina Rosen get the Phoenix award. Very cool.